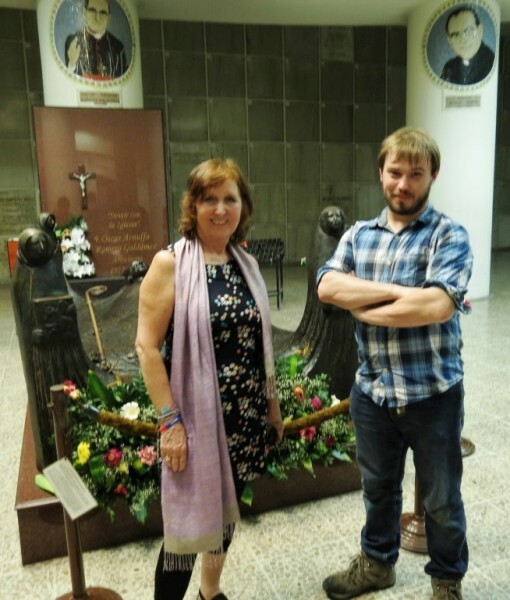 In early February, Clare Dixon, Ben White and Kathleen O’Brien travelled to San Salvador. Here’s a glimpse of their visit to Romero’s tomb on the day it was announced that the Vatican had declared this ex-CAFOD partner a martyr. Around midday, we drive down to the Cathedral, which lies on the Avenida Monseñor Oscar Romero. Street names matter in San Salvador. At the moment there is a fierce argument raging between the current Mayor, Norman Quijano, who wishes to change the name of the road ‘San Antonio Abad’ to ‘Robert D’Abuisson’ after the man who ordered Romero’s death and founded the ARENA political party. We drive along this road and see graffiti saying “Ni calles ni caminos con nombres de asesinos” (Neither streets nor roads with names of assassins). About the author: In early February, Clare Dixon, Ben White and Kathleen O’Brien travelled to San Salvador. Here’s a glimpse of their visit to Romero’s tomb on the day it was announced that the Vatican had declared this ex-CAFOD partner a martyr. Support CAFOD’s work by making a donation today.